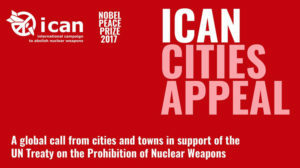 Earlier this month, International Campaign to Abolish Nuclear Weapons (ICAN) launched its new Cities Appeal, ICAN Save My City, a global campaign to persuade cities to express support for the United Nations Treaty on the Prohibition of Nuclear Weapons (TPNW). While ICAN’s new Cities Appeal is global in scope, it was inspired by successful initiatives a lot closer to home. Thanks to incredible local organizing by Chesapeake PSR, PSR-Los Angeles and allied organizations to support TPNW, this past August, on the occasion of the 73rd anniversary of the atomic bombings of Hiroshima and Nagasaki, Baltimore and Los Angeles each passed unanimous “Back from the Brink” city council resolutions that included text affirming support of the TPNW. The California state legislature then passed its own resolution. These local resolution successes in Baltimore, Los Angeles and other American cities around the United States inspired ICAN’s global call to action for cities around the world. Elsewhere, Sydney, Australia and Toronto, Canada have also affirmed their support of the TPNW. These cities’ support sends a signal to the governments of Australia and Canada, who have not yet signed or ratified the TPNW, that the historic nuclear ban treaty has major popular support in their countries. Similar initiatives are under way in other cities as well. In July, 2017, 122 nations adopted the TPNW at the United Nations. Once 50 nations have ratified it, the treaty will enter into force. So far, 69 nations have signed the treaty, and 19 have ratified it. These include some of the nations whose citizens have been directly impacted by nuclear weapons proliferation and testing. Resolutions affirming cities’ support of the TPNW aren’t just a figurative gesture of approval— the health and safety of city residents is at stake in the effort to prevent nuclear war. Cities are prime potential targets in a possible nuclear strike. Cities can also have a major influence on governments, as local representation of the will of constituents. Cities’ endorsement of TPNW is critical to demonstrate popular will to nations who have not yet signed or ratified the TPNW, and to affirm that their citizens support a ban on nuclear weapons. PSR and its chapters and affiliates will continue our efforts here in the United States to expand support for the international nuclear ban treaty at the local, state and national level. The world is watching.